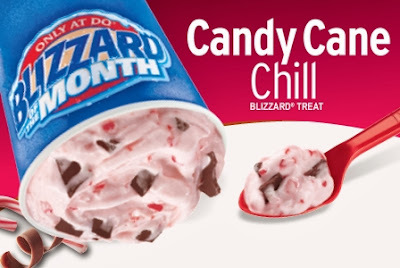 The Candy Cane Blizzard is back at Dairy Queen for the 2018 holiday season and is featured as the December 2018 Blizzard of the Month. The returning flavor features candy cane pieces and chocolaty chunks mixed into the chain's signature vanilla soft serve ice cream. Dairy Queen also continues to offer the limited-time Fall 2018 Blizzard menu which includes four flavors: Snickerdoodle, Dipped Strawberry, Oreo Hot Cocoa, and Reese's Outrageous. The fall flavors have been available since September when it replaced the summer menu.